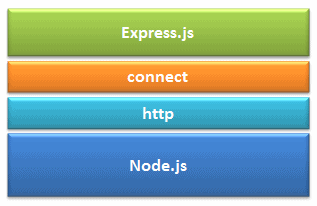 Express.js is based on the Node.js middleware module called connect which in turn uses http module. So, any middleware which is based on connect will also work with Express.js. Makes Node.js web application development fast and easy. Allows you to define routes of your application based on HTTP methods and URLs. Includes various middleware modules which you can use to perform additional tasks on request and response. Easy to integrate with different template engines like Jade, Vash, EJS etc. Allows you to define an error handling middleware. Easy to serve static files and resources of your application. Allows you to create REST API server. You can install express.js using npm. The following command will install latest version of express.js globally on your machine so that every Node.js application on your machine can use it. The following command will install latest version of express.js local to your project folder. As you know, --save will update the package.json file by specifying express.js dependency. 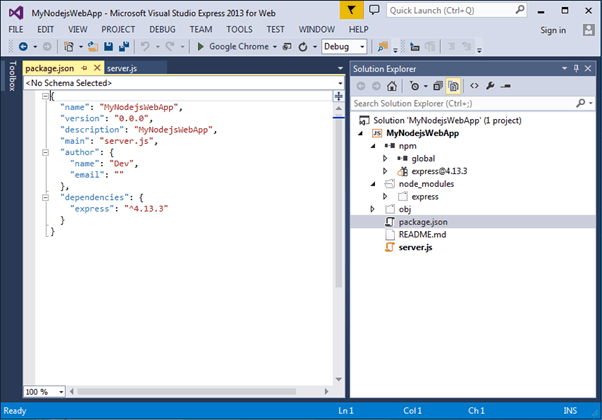 In the node.js web app, we created a simple node.js web application in Visual Studio. 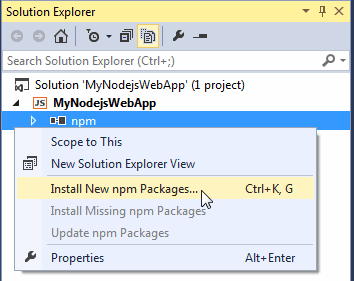 Now, to install Express.js, right click on the project MyNodejsWebApp -> select Install New npm Packages. It will open the following dialog box. Now, type 'express' in the search box. 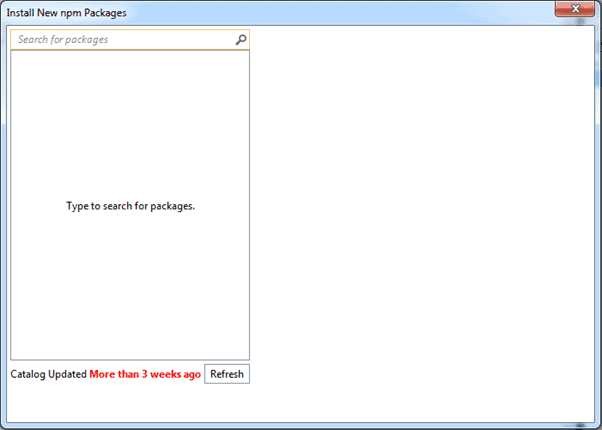 It will display all the packages starting with express. Select latest version of express.js and select Add to package.json checkbox and then click Install Package button as shown below. So, this will install express.js package into your project under node_modules folder. 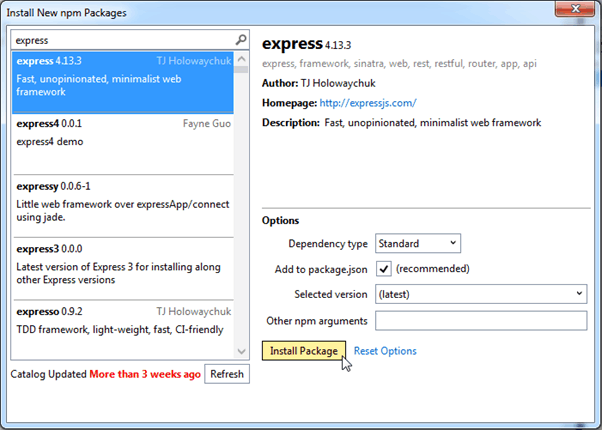 It also adds a dependencies entry for express.js as shown below. Now, you are ready to use Express.js in your application. Learn how to create web application using Express.js in the next section.